Natalie A. Naylor. Women in Long Island’s Past: A History of Eminent Ladies and Everyday Lives. Charleston: The History Press, 2012. Pp. 192. ISBN: 9781609494995. Paper, $19.99. Natalie Naylor has written an excellent account of the often overlooked role of women in Long Island’s history. As the title suggests, it includes both women whose names will be familiar to most readers and the many more ordinary women who have lived and worked on Long Island over the years. 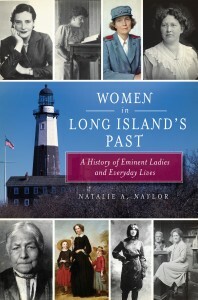 With this book, Naylor achieves her goal of making women more visible in the history of Long Island. Women in Long Island’s Past provides an historical overview of the experiences of Long Island women, but is not only targeted at a scholarly audience. The book’s structure is roughly chronological and built around fourteen themes, starting with “The First Long Islanders” and ending with “Historians and Preservationists.” This approach weaves Long Island women into the broader themes of Long Island, American and women’s history, creating a strong and compelling narrative. These factors combine to make Women in Long Island’s Past readable and accessible to a wide range of readers. Additionally, readers with a strong interest in their local history are likely to find their area represented. Naylor taught Long Island and American social history at Hofstra University for over thirty years and served as director of the Long Island Studies Institute from 1985 to 2000. She has made an impressive contribution to her field with articles on numerous topics relating to Long Island history, service as an editor of a number of important collected works, regular public lectures, and her support and facilitation of the work of many other local historians. Several of her titles include The Roots and Heritage of Hempstead Town and Journeys on Old Long Island: Travelers’ Accounts, Contemporary Descriptions and Residents’ Reminiscences, 1744-1843. Women in Long Island’s Past adds to one of Naylor’s major focuses: the history of Long Island women. As she explains in her introduction, Naylor began investigating Long Island women for a 1984 article. She pulled from Notable American Women about fifty individuals who lived or worked on Long Island (including Brooklyn and Queens) during their years of achievement (p. 10). Naylor expanded her scope when she helped organize a 1996 conference entitled Long Island Women: Activists and Innovators. The papers from this became the basis for a 1998 volume of the same name, which Naylor edited with Maureen Murphy. Long Island Women includes detailed examinations of topics as diverse as seventeenth century Quaker activists, Newsday founder Alicia Patterson and twentieth-century Long Island feminists. In Women in Long Island’s Past, Naylor draws on much of the research from Long Island Women, but creates a more concise overview and fills some holes not addressed in that book. She has chosen to include only women who are no longer living and there is only brief inclusion of women since World War II in the final two chapters and the Epilogue. This diverges from the 1998 book, which includes chapters that come up to the 1980s and 1990s. While fascinating, these chapters do lack the objective distance with which earlier periods are treated, affirming Naylor’s assertion that, “it is difficult to provide historical perspective on the recent past” (p. 11). Women in Long Island’s Past has three broad approaches to the women it discusses. Some well-known women, such as first lady Edith Kermit Roosevelt or pilot Harriet Quimby have their own named section within a chapter and receive extensive treatment. Other women, such as philanthropist Dorothy Melville or suffragist Isa Bunce Sammis are briefly discussed along with other similar women. Finally, Naylor uses what limited records exist to tease out the role and experiences of the remainder of the Long Island women she covers. Frequently she presents a specific individual to exemplify a larger group of women. These groups range from Native Americans to women who operated boardinghouses to the many women who worked at Grumman and other defense plants during World War II. One minor shortcoming of the book is the inclusion of women with only a tenuous link to Long Island. For example, Naylor admits that Eleanor Roosevelt’s time on Long Island was so limited that she barely qualifies for inclusion (p. 60) and the landscape architects she discusses designed Long Island gardens, but did not live there (p. 81-82). The overall goal of the book would have been better served by focusing on women with stronger Long Island links and excluding those with only a passing connection to the area. Women in Long Island’s Past leaves the reader wanting to know more because it touches so briefly on so many topics. However, it is invaluable to have this concise, approachable overview of topics and research that have received little attention outside of individual articles or Long Island Women: Activists and Innovators. Women in Long Island’s Past helps bring the important role of women in Long Island history into the public eye, while also pointing to areas where further research is required.